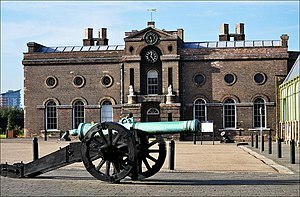 The Royal Military Academy Woolwich was founded in 1741: it was intended to provide an education and produce "good officers of Artillery and perfect Engineers". RMA Woolwich was commonly known as "The Shop" because its first building was a converted workshop of the Woolwich Arsenal. A larger building was specially designed for the Royal Military Academy by James Wyatt, built between 1796 and 1805 and opened for use the following year. The Royal Military Academy Woolwich closed in 1939 and in 1947 the Royal Military Academy Sandhurst was formed on the site of the former Royal Military College at Sandhurst (which had previously only trained officers for the Infantry and Cavalry) with the objective of providing officer training for all arms and services. Durkan Group bought the Woolwich site by public tender in 2006. The Woolwich buildings have since been converted and extended into 334 houses and apartments, including 150 for a housing association. ↑ "Royal Engineers Museum – Articles – Royal Military Academy, Woolwich". http://www.remuseum.org.uk/articles/rem_article_academy.htm. Retrieved 2008-12-24. ↑ 3.0 3.1 3.2 Binney, Marcus (2008-03-21). "Royal Military Academy in Woolwich is turned into luxury apartments". The Times. London. http://property.timesonline.co.uk/tol/life_and_style/property/buying_and_selling/article3590265.ece. Retrieved 15 April 2011. ↑ 6.0 6.1 The London Gazette: no. 27359. p. 6295. 27 September 1901. Wikimedia Commons has media related to Royal Military Academy, Woolwich.